Our worship services at St Thomas come from the rich and beautiful tradition of the Book of Common Prayer, and the entire service is printed in booklets with weekly inserts for the readings. We celebrate the Eucharist at each weekly Saturday and Sunday service. We value good music and strong preaching that connects to everyday life. Each of our services has a bit of its own flavor and musical offerings, and each includes weekly readings set by a national lectionary. On special occasions, we offer additional services and musical offerings that combine the voices of our music groups. Children’s Church is offered during both Sunday services during the readings and sermon, and children rejoin parents for communion. Sunday School and adult formation classes on various topics are offered between the Sunday services. Our Saturday evening service is a quieter service with hymns played on a grand piano and accompanied by a cantor. This service has a relaxed and contemplative feel. Our Sunday 8:45 service includes praise songs played by a live praise band, including classically trained guitarists, piano, upright base, and drums. All songs are in the service booklet. We read weekly Hebrew Bible (Old Testament), Psalm, and Gospel readings at this service. Our Sunday 10:45 service includes hymns from the church hymnal are played on the organ with brass and choral accompaniment. 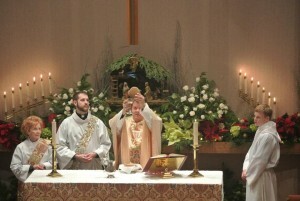 Sections of the service use a “cantor” to lead songs, and through much of the year, the Eucharistic prayers are partially sung by the priest.